You don’t have to attend too many budget hearings or council meetings before you recognize the ceaseless cries of “The county needs to live within its means.” The howls come from a relatively small group who vocally demand that the county cut “out of control” spending. It’s like reciting lines from a bad movie you’ve seen many times but just can’t resist watching when it’s on TV. Yawn. Until those demanding “fiscal conservatism” roll up their sleeves, start reading the financial documents, and cite specifics, these are just opinions. And you can’t effectively run a business, a county government, or a school system on opinions. Imagine how shocked I was to realize I agree with them on one point: Cecil County hasn’t been living within its means. For too long the county has been neglecting some of its obligations because it couldn’t figure out how to cover all of its expenses. Adequate schools, well-maintained roads, and properly equipped emergency services aren’t extravagances, they are the cost of living in modern society. During the FY16 budget season, there was hot debate over necessities: replacement AEDs OR emergency communications systems OR long neglected capital projects at county schools. We aren’t choosing toppings for a pizza–it shouldn’t be an either/or decision. In many cases ALL the requests are necessary. At different points in that budget cycle, both (former) County Executive Tari Moore and (current) Council Member Alan McCarthy remarked that Cecil County needs to start addressing mandates that aren’t currently being met regarding emergency radio communications (deficiencies in that system made the news again that spring), water treatment, and school services. Cecil County, ALL of these items are our responsibility whether we individually agree with the mandate or not. It’s not a matter of IF we meet these needs, it’s a matter of how. The county can choose how it plans to comply with and fund these programs but they must be implemented. 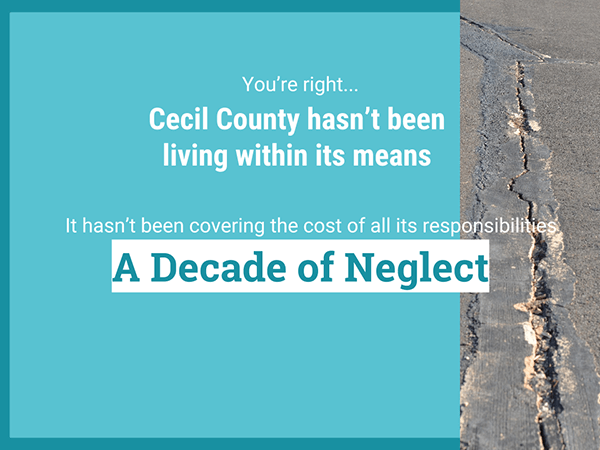 Unfortunately, for the last decade, Cecil County has neglected sufficient funding for capital improvements so there is now a backlog of expensive but still critical needs. One glaring example is the Cecil County Public Schools’ list of deferred maintenance projects that now totals over $49 million–up $5 million over last year. How does CCPS determine facilities needs? Each fall CCPS is required to prepare a Comprehensive Maintenance Plan (CMP) detailing the maintenance activities that are projected to occur in the next 10 years. CCPS is also required to prepare a Capital Improvement Plan (CIP) detailing current and future major renovations and new buildings. The CMP and CIP must be submitted to the State Public School Construction Program for review and approval. What are “Deferred Maintenance” Projects? 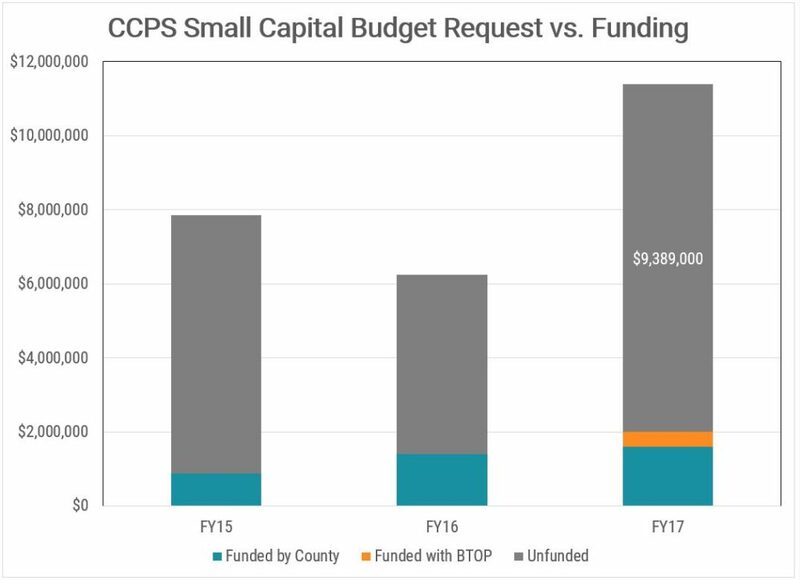 Projects on the deferred maintenance list are too costly to complete from funds in the annual maintenance budget and end up as part of the CCPS capital budget request. Unfortunately, few projects have received county funding in recent years so the list continues to grow as CCPS does the best it can to address projects on the list with the available funds or the projects expand to become a large capital request (like when “repair” becomes “replacement”). Now that we have some background on maintenance and capital improvements, let’s talk about the history of a few of the projects in the capital budget request. Since the state provides roughly 60% of the funding for large capital projects, let’s focus on the small capital projects. Requested since 2013. The FY 2017 request will be its 5th year on the list. Requested since 2014. Not included in FY 2017 request. Courts were unplayable for several weeks during the Spring 2018 season which forced the team to play “home games” on the road and leave school early each day to practice at another facility. Included in FY 2015, FY 2017, FY 2018 requests. Courts were unplayable for several weeks during the Spring 2018 season which forced the team to play “home games” on the road. That means tennis courts at four of the county’s five high schools need to be replaced. If there’s any silver lining, it’s that CCPS may find some economies of scale in replacing them all at once. Since 2014, CCPS has requested funding to connect Cecil Manor Elementary School to nearby municipal water lines. What’s the downside to the school remaining on well water? From a dollars and cents perspective, local well water tends to speed the deterioration of HVAC equipment, one of the most expensive systems in any building. From a water quality perspective, higher than normal nitrate levels are reported at the school from time to time. This contamination is mostly due to nearby agricultural activity. CCPS is a component unit of Cecil County government with no taxing authority so paying for maintenance and improvements is largely the responsibility of the county. Choosing to continue this trend of minimal funding for small capital projects is a choice to disregard the county’s obligation to maintain facilities built using taxpayer funds. 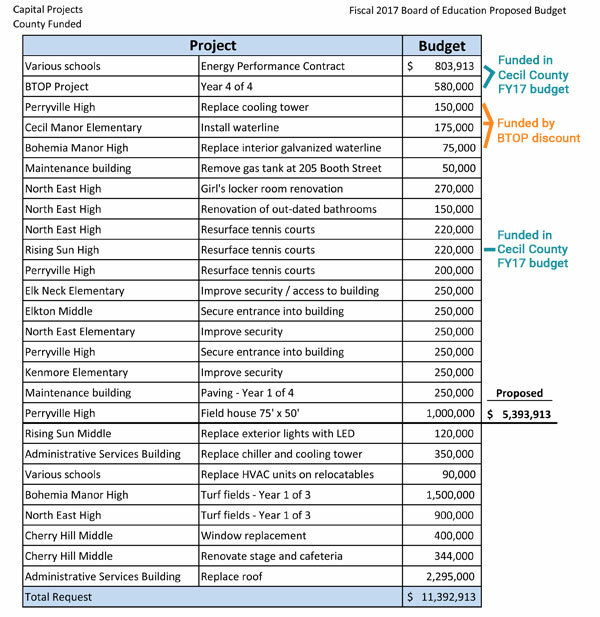 Below is the small capital budget request CCPS submitted to Cecil County for FY17. I’ve noted which line items were funded and the source of the funding. The projects in the request are prioritized, with the most important at the top. The county funded the first two lines because they are multi-year obligations–then they skipped over quite a few mechanical systems requests to fund tennis courts at Rising Sun High School. I’m not denying that the RSHS tennis courts required resurfacing. I even went out to see the conditions for myself. Fortunately, CCPS applied for and received a discount of $400,000 on the BTOP program and used that money to fund the next three projects on the list. The projects on this list won’t go away–if you ignore them they will only become bigger, more expensive projects. And at $11 million, this list represents less than one quarter of the total projects on the $49 million deferred maintenance list. It’s time to face the facts and start funding capital projects again so CCPS can begin to whittle away at this list. New Cecil County Executive Alan McCarthy is now working with his team to draft the budget that he will send to the County Council in on March 31. Once the County Council receives the budget, they can either approve it as proposed or cut from it. The council can’t add to the budget so we need to voice our expectations NOW. How can you advocate for public education in Cecil County? No matter which method of communication you prefer, show your support for adequate public education funding in Cecil County. What’s all this talk about transparency?